������ Si Sa Ket is a quiet province on the Cambodia border with Khmer ruins scattered throughout the province.Most notable are the two ruined sanctuaries of Wat Sa Kamphaeng Yai and Noi,dating back to the 10 th century. 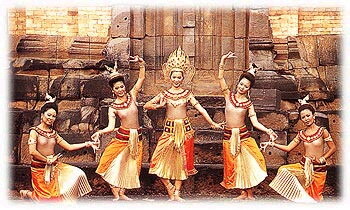 However, the most famous Khmer site is actually in Cambodia. Khao Phra Wihan was built over 10 centuries ago and is one of the most spectacular Angkor-period sites. Built as a Hindu temple, it begins in Thailand and rises to 600 metres with the main sanctuary in Cambodia. After a long period of war, its wonderful craftsmanship,stairways and courts are now being restored. Thi walk to the summit is long and steep, but visitors are sure to be impressed by the size and complexity of its design. Si Sa Ket has an area of 8,840 square kilometres, comprising the following districts: Muang Si Sa Ket, Kanthararom, Kantharalak, Khun Han, Phrai Bung, Khukhan, Prang Ku, Uthumphon Phisai, Rasi Salai, Yang Chum Noi, Huai Thap Than, Non Khun, Si Rattana, Wang Hin, Bueng Bun, Nam Kliang, Phu Sing, Benchalak, Muang Chan, Pho Si Suwan and Sila Lat. From Bangkok, take Highway No. 1 to Saraburi and Highway No. 2 to Nakhon Ratchasima, then use Highway No.226 to Si Sa Ket via Buri Ram and Surin, a total distance of 571 kilometres. Visitors can fly from Bangkok to Ubon Ratchathani and continue the trip by bus to Si Sa Ket. Call Thai Airways at Tel: 1566, 0 2628 2000. Located in Wat Sa Kamphaeng Yai, Ban Kamphaeng Yai, Tambon Sa Kamphaeng Yai, it is the biggest and most perfect Khmer Ruins in the province. The Khmer Ruins comprises three stupas on the same base lining in North-South direction and facing east. The main stupa, at the middle, made from sandstone and bricks in some part, houses carved lintel depicting God Indra on the back of Erawan Heavenly Elephant above the Kiattimukha. Other two stupas are made of brick with sandstone decorations such as lintel, gable frame and door frame. Behind the southern stupa is another brick stupa. Before all are two brick vihara surrounded with walls made from laterite and sandstone and 4 Gopuras (doors) at all directions. Brick vihara at north houses a carved lintel depicting Reclining Vishnu. The southern brick vihara houses a lintel depicting God Shiva and Goddess Uma seated on Nonthi Cow. Presently, this Khmer Ruins belongs to the division of Archeology, Fine Arts Department. Many antiques are found from this site such as lintels depicting Shiva God, Krissana God fighting Vattana Cow, Buddha statue in the attitude of meditation under naga, Buddha statue in attitude of meditation, and terra cotta Buddha images. By the style appearing on gables, lintels, and antique, particularly inscription at the doorframe of Sa Kamphaeng Yai Khmer Ruins, this ruins was probably build in the 11th Century with Bapuan Art style of Khmer. It was served as shrine for God Shiva before changing into Mahayana Buddhist temple in 13th Century. How to get there: The Khmer Ruins is 26 kilometres from Si Sa Ket City and 2 kilometres from Amphoe Uthumphon Phisai, via highway 226. Situated in Wat Sa Kamphaeng Noi, Ban Klang, Tambon Khayung, The Khmer Ruins comprises laterite stupa and chapel with a big pond at front, all are in the embrace of laterite wall. Once it had a stone carved lintel depicting ‘the Varun God’, the god of rain, sitting on the throne above three swans. The carving was placed over Kiattimukha. The Khmer Ruins in Bapuan is dated back to the 11th Century. At the first place, it was used for religious purpose. In the 13th Century, under the reign on King Chaya Varaman VII, Bayon Architectural style was added. During such time, the ruins was called ‘Arokaya Sala’ to be served as community hospital. How to get there: The Khmer Ruins is 8 kilometres from Si Sa Ket City, on the right of highway 226 (Si Sa Ket-Uthumphon Phisai). Prasat Ta Leng is at Ban Prasat, Tambon Kanthrarom, 20 kilometres from the district office. A square pagoda adorns the site. The front doorway still has clear, beautiful designs. The sanctuary was built around the 16th-17th Buddhist century. Prasat Prang Ku is 10 kilometres from the district office. Prang Ku is a small Khmer site built of large laterite slabs. It is over a thousand years old. The front part has a large pool that is the habitat of waterfowls in the dry season. Prasat Ban Samo is 10 kilometres southeast of Prang Ku. A laterite wall surrounds this small Khmer site. The square pagoda has a lintel above a fake doorway facing the south. An ancient pool lies beyond the wall. This temple is 8 kilometres away on the Si Sa Ket-Yang Chum Noi road. The site has a traditional design. The area is used for religious ceremonies and as a museum to display the life of Isan tribes such as Lao, Khmer, Suai, and Yoe. Located in the heart of Si Sa Ket City, the Buddhist temple’s vihara houses ‘Luang Pho To’ the sacred icon of Si Sa Ket. The gigantic Buddha image in attitude of subduing Mara is 6.85 metres high and 3.50 metres wide. Built during Khmer era over a thousand years ago, the statue was originally carved from stone and decorated later at unknown time. This is a large public park inside an agricultural college 2 kilometres from the provincial hall. At the park one can see flowering shrubs called Lamduan that are the official plants of the province. Lamduan is a Thai flower that is at its most enchanting when it blooms from March to April as its sweet fragrance covers the whole area. Located in the municipality region, the Buddhist temple is remarkable with architectures made from million of colourful glass bottles donated by the people. All the architecture is beautiful, particularly the pavilion called ‘Sala Thansamo Maha Chedi Kaeo’ Ubosoth located mid of the pond. The ubosoth houses a very beautiful white jade Buddha image. How to get there: From Si Sa Ket City to Amphoe Khun Han, use highway 211 and 2111, en route Amphoe Phayu and Phrai Bueng. This route is 61 kilometres long. Located at Ban Tamnak Sai, Tambon Bak Dong, Tamnak Sai Khmer Ruins has a single stupa on sandstone base. The brick stupa has rectangular shape and one real door at the east while the other three are fault doors with carved door frame on the brick. Two carved guardian lions are watching the gate. The front door has frame made of sandstone. The door once was decorated with carved lintel depicting the God Narai lying on naga, with Laksami sitting at his feet, and Brahma rising from his navel. Both side of Brahma are hermit and a person in the frame. Now such lintel is kept in Phimai National Museum. Located 20 kilometres from the district office, this medium-sized waterfall originates from a stream in the Banthat mountain range. Above the fall is a rock plateau. It is at its most beautiful in the rainy season. This is 24 kilometres from the district office on the Kanthrom-Ban Samrong Kiat road. The fall drops down several rock levels and has water the year round. Located in Cambodia, right by Amphoe Kantharalak, some 35 kilometres from Amphoe Kantharalak, the cliff-top Khmer sanctuary once belonged to Thailand. It was enlisted as an antique architecture by the Fine Arts Department and with announcement in the Royal Gazette on October 11, 1940. After the World Court ruling on July 15, 1962, the sanctuary belongs to Cambodia until now. For more information about visiting Phear Vihear Sanctuary, call Amphoe Kantharalak at 0-4566-1422 or Ranger Unit 23 at 0-4566-1443. Visitor to Preah Vihear Sanctuary needs to pay 200 baht each to get through Khao Phra Wihan National Park, 5 baht for border crossing (pay to Amphoe Kantharalak) and 200 baht entry fee (pay to Cambodian Government). Visiting the sanctuary requires at least an hour. How to get there. From Si Sa Ket City, use highway y221 to Amphoe Kantharalak en route Ban Phum Saron. Tourist requires to access the sanctuary via Khao Phra Wihan National Park and pay the border crossing charge first. The sanctuary is located on cliff top at 500 metres elevation which has long been considered a sacred place among various local races in the region. Sanctuary and lingam in Shaivism was established here in the 11th Century and attracted people from all around and pilgrimages from far away. With outstanding location on mountain slope, Preah Vihear Sanctuary comprises 4 parts. The steep stair way leads to the first Gopura which is four-faced pavilion. Then, the walkway leads to the second Gopura which houses carved gable depicting ‘Churning the Sea of Milk’ which is related to royal coronation of Khmer king. The third part is called ‘Maha Monthian’. The last part, by the breath taking cliff, is the sacred inner sanctuary called “Prasat Prathan’ which houses Shivalinga. The sanctuary faces north (or Thailand) towards the up-hill entrance. This is a medium-sized waterfall at its loveliest in the rainy season. It is on the Ban Phumisaron-Ban Samrong Kiat road. A 2.5-kilometre road on the left then leads to the waterfall. One can find interesting flora along the way which makes for fine nature study. The park’s territory lines Thailand-Cambodia border, over high cliff and lush forest of Dongrek Range. Khao Phra Wihan National Park acquires 130 square kilometres area of Amphoe Kantharalak of Si Sa Ket, Sub Amhoe Nam Khun and Amphoe Nam Yuen of Ubon Ratchathani. The country’s 83rd National Park was established on March 20, 1998. The park features dry evergreen forest, mixed dipterocarp forest, and deciduous dipterocarp forest. It is home to numerous wildlife which roams between two countries such as wild hog, deer, barking deer, rabbit, squirrel, gibbon, civet. Mo I-Daeng Cliff. One of the best bird’s eye view point of Northeast, the red-colour rock cliff is situated right on Thailand-Cambodia border. It offers panoramic view of vast Cambodian forest and Preah Vihear Sanctuary. Bas relief. Situated south of Mo I-Daeng cliff, the bas relief carved on the red- sandstone cliff depicts three gods in Khmer style. Khmer craftsmen probably practiced here first before the real carving at Preah Vihear Sanctuary. Double Stupas. Two sandstone stupas, or ‘Phrathat’ for local people, in cube shape and round top are situated west or Mo I-Daeng Cliff. The stupas houses things that mirror prosperity of such period. Don Tuan Khmer Ruins. Built during the 10th -11th Century, the Khmer Ruins in Ban Phum Saron is located 300 metres from Thailand-Cambodia border. A legend says a lady, Namnomyai, had stayed here on her way to visit a King. How to get there: Use highway 2243, and get in to small road at km. 91 and continue for 4 kms. Sa Trao. The stream runs through rock plain foot of Preah Vihear Mount, before running through subterranean tunnel strengthened by rock walls. It is assumed that such low land is Barai or Khmer’s reservoir. The stream and around is now well cleaned and filled up with water. Namtok and Tham Khun Si . The three-tier waterfall, above the cave, is situated west of Sa trao close to trail to Preah Vihear. And Khun Si Cave in gigantic size was believed accommodation of Khun Si, noble man who controlled rock cutting at Sa Trao for constructing Preah Vihear Sanctuary. Huai Kanun Dam. Situated 25 kilometres from the park’s headquarter, the dam and its reservoir offers nice scenery for picnic, relax or camping. The park’s unit is located nearby. Chong An Ma. The border check point between Thailand and Cambodia is in Tambon Song, Amphoe Nam Yuen, Ubon Ratchathani. The check point, where border trade is allowed, is open every Tuesday and Thursday. - From Bangkok, use highway 1 (Pahonyothin Road) turn right at Saraburi into highway 2 (Mitraphap Road). At Amphoe Si Khio, turn right into highway 24, and travel via Amphoe Pak Thong Chai, Sangkha, and Kukhan. Turn right into highway 221, and head to Amphoe Kantharalak and keep going to the park. - From Ubon Ratchathani, use highway 2178 and 221 via Amphoe Warom Chamrap, Samrong, Benchalak, and Kantharalak to the park. For more information about accommodation and camping ground, call tourist centre Khao Phra Wihan National Park at 0-4561-9214 or the Department of National Park at 0-2562-0760 or visit www.dnp.go.th. Located in Wat Prasat Phanaram, Ban Prasat, the Khmer ruins was adapted in later era like Si Khoraphum Khmer Ruins in Surin. Huai Thap Than Khmer Ruins has very similar roof, but quite higher. It comprises 3 brick stupa on laterite base in North-South direction standing in the laterite walls with arch gates. It might have 4 gates in the past, but today only southern gate remains. The main stupa at the middle is a bit bigger than other two, but its roof, in rectangular shape, is shorter. It has only gate at the east with sandstone frame decorated with unfinished carved lintel depicting a man standing above the kiattimukha with flower frame. The second stupa on another side has the same size but different style. The stupa is filled up with bricks, it has fault doors with sandstone door frame. There are carved lintel depicting the churning sea of milk lies in front of southern stupa. Assumed from art style of the lintel, this Khmer Ruins may be built in the 11th Century with blending art style of Khlang and Bapuan, before being adapted later. How to get there: From Si Sa Ket City, use highway 22 for 39 kilometres, turn right at Amphoe Huai Thap Thann and keep going for other 8 kilometres. This zoo is in Rama IX Chaloem Phra Kiat Forest Park in Non Nong Kwang, 4 kilometres from the provincial hall. It is a good place to relax and to see wild animals in the zoo. Located in Mueang Municiplaity, Ubon Road, the beautiful building belongs to Si Sa Ket nobleman Khun Ampai Panich (In Naga-siharat). Built by Chinese and Mon technicians in 1925, the Chinese style building was gracefully decorated with stucco. It is well renovated and preserved, and eventually won gold medal in the project of conversing urban architecture in 1987. The Fine Art Department has registered the building as ancient building already. The city pillar shrine is near the provincial hall. This square structure is decorated with marble and stained glass. The chemical-free and Buddhism-devout community acquires over 100 rais area in Tambon Krachaeng. Sisa Asoka is community model in self sufficiency, turning it back to capitalism and prefers Buddhism-devout lifestyle. Its remarkable success attracts organizations from nationwide to study its story, and tourists to shop for chemical-free fruit, vegetable, and herbs from the village’s outlet. This is on a steep cliff in the Phanom Dong Rak mountain range near the Thai-Cambodian border, 8 kilometres from Ban Phumisaron or 38 kilometres from the district office. This small Khmer site has a square pagoda built of brick, a doorway of stone and a lion guarding the entrance. Some 5 kilometres from Amphoe Kantharalak, on the right of highway 226 (Kantharalak-Pha Mo I-Daeng) there is a 20-kilometres (16 kilometres on asphalt road) cutting through villages such as Ban Thung Yai, Ban Thung Sawang, Ban Rong Ta Chun, Ban Cham Muang, and Ban Nong Kao. These villages are significant fruit producers of Si Sa Ket. Their major products include rambutan, durian, lanson, mangosteen, parkia (stink bean) and rubber. Every June, fruit offspring from these orchards will be available, making it a very nice period to visit, tasting and buying the fruit directly from the plantation. The interesting orchards include rambutan plantation of Ban Cham Muang, durian plantation of Ban Sam Khi Lek, parkia and year-round mango at Ban Nong Kao. Located in Moo 6 Ban Prasat, Tambon Kanthararom, Ta Leng Khmer Ruins features a single stupa standing on the base. The stupa has rectangular base facing east. Presently, only the front wall and some side walls remain. The front door is the real door while the other three are fault doors. Pillars by the front door are delicately carved. The ruins was built in 11th-12th Century. Many lintels are found scattering. The lintel at the northern gate depicts God Indra on Erawan Heavenly Elephant in the frame over kirtimukha. God Indra encarved in that lintel just took garland out of his mouth and holding it with both hands. Other lintels feature the same depiction except one depicting 7 hermits sitting in line during practicing meditation. From such architecture and art style, Taseng Khmer Ruins was built in Bapuan style during the year 1017- 1087. How to get there: From Si Sa Ket City, use highway 220 to Amphoe Ku Khan, turn right at police station and keep going for three kms. Turn left at the intersection and keep going for 300 metres, turn right and continue for other 8 kms. Turn right at Ban Prasart, the Khmer Ruins is on the right.